The 91st Academy Awards are in the books at last. 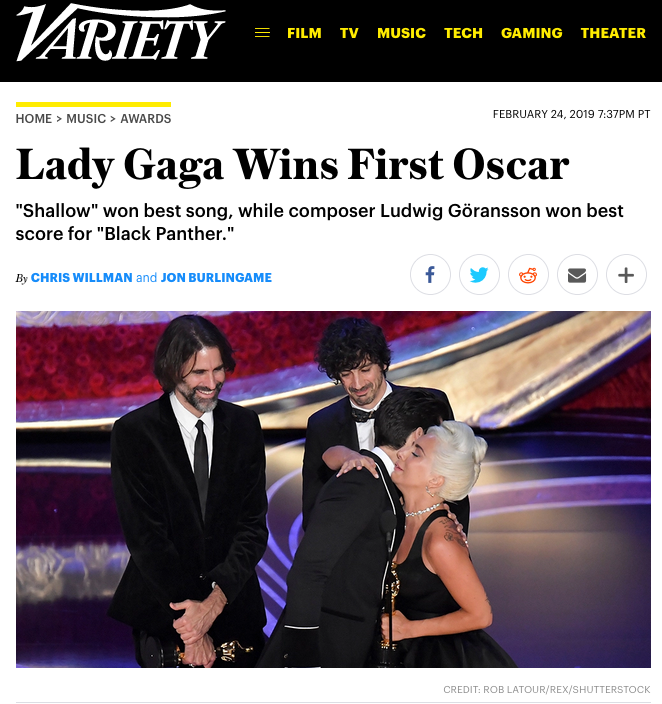 It was a joy to report on composer Ludwig Goransson’s victory in the original-score category, more than a year after I first called attention to his African-infused music for Black Panther in the pages of Variety. 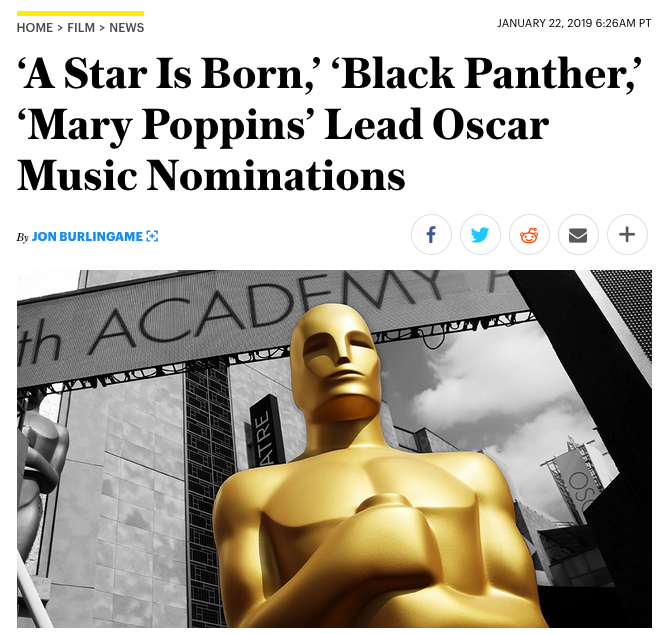 In the days leading up to the awards, we also broke the news about Alexandre Desplat’s inability to attend (recuperating from throat surgery) and about Bette Midler performing Marc Shaiman’s moving song “The Place Where Lost Things Go” from Mary Poppins Returns. 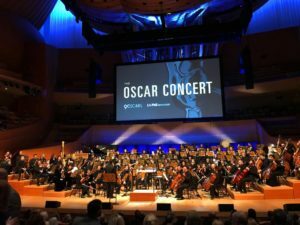 My story about Sunday’s Oscarcast also discusses the L.A. Philharmonic’s performance of a touching John Williams piece from Superman (an Oscar nominee 40 years ago!) for the “In Memoriam” segment. 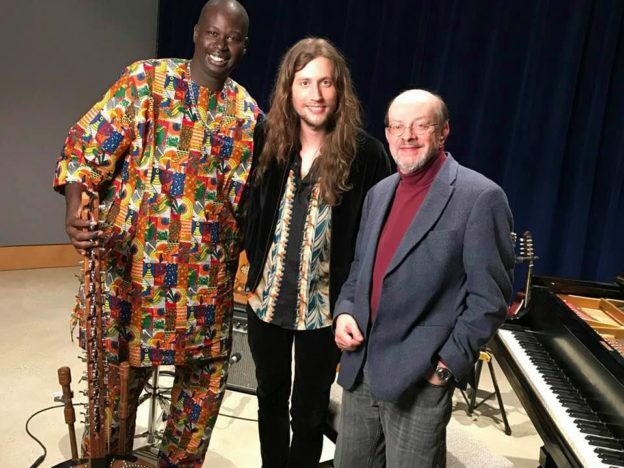 This entry was posted in Composers, Film Music and tagged Alexander Desplat, Bette Midler on Oscars, Goransson wins Oscar, LA Philharmonic Superman, Ludwig Goransson, Oscar music 2018, Variety on February 25, 2019 by Jon Burlingame. 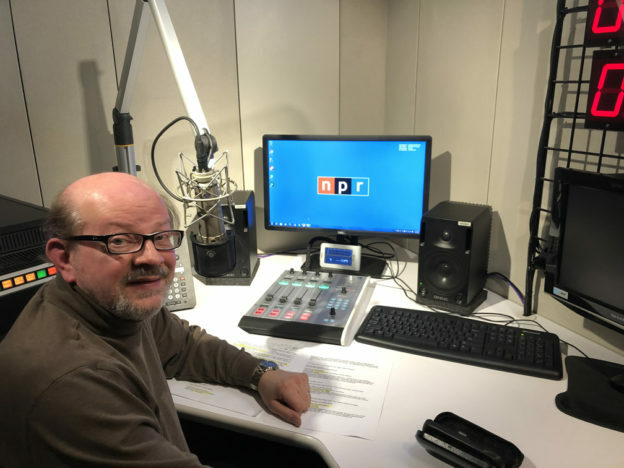 This entry was posted in and tagged Here and Now, NPR's Here and Now, Oscar music 2018 on February 22, 2019 by Jon Burlingame. 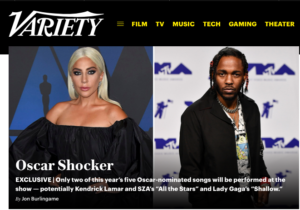 On January 24th, we at Variety received word that the Oscar producers had decided to perform only two of the five Best Song nominees on the show (Lady Gaga’s “Shallow” and Kendrick Lamar’s “All the Stars,” by the two most popular recording artists). Within an hour, I had three other solid sources confirming this, so that afternoon we broke the story. (It was the lead story on Variety‘s front page for nearly a day.) The Academy denied it, of course, but the backlash was immediate and the Twitterverse blew up over it. Producers were forced to retrench, and one week later, artists from the other three songs were invited to perform. And in our most recent exclusive, we broke the news that Bette Midler would perform the nominated song from Mary Poppins Returns on the show. This entry was posted in Composers, Film Music, Interviews and tagged 91st Academy Awards, Best Song nominees 2018, Bette Midler, Mary Poppins Returns, Oscar music 2018, Variety on February 17, 2019 by Jon Burlingame. 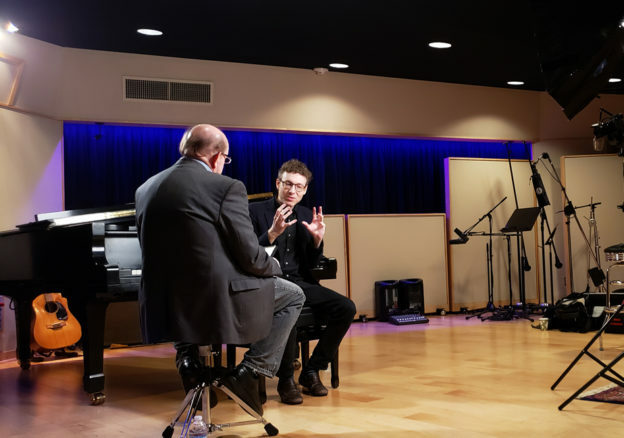 This entry was posted in and tagged Beale Street music, If Beale Street Could Talk, Nicholas Britell, Oscar music 2018, SoundWorks Collection on February 12, 2019 by Jon Burlingame. Waking up on Oscar morning to find out the nominees is exciting enough — racing to be the first online with a thoughtful, historically informed analysis can make the heart beat even faster. This year was no exception, and our initial breakdown of the nominees was up within an hour of the announcement. It took another couple of hours for all of it to sink in and follow up with 10 surprises and a few cogent observations about the race. This entry was posted in Composers, Film Music and tagged Oscar music, Oscar music 2018, Oscar music nominations, Oscar music surprises, Variety on January 22, 2019 by Jon Burlingame. On Dec. 17, the Academy of Motion Picture Arts & Sciences released its “shortlists” of movie songs and scores that will be eligible for nomination for this year’s Oscars. It’s the first time since 1979 that they’ve used this process — narrowing voters’ choices from the 156 qualified scores and 90 qualifying songs down to a more manageable 15 scores and 15 songs from which to make their final five choices in each category. 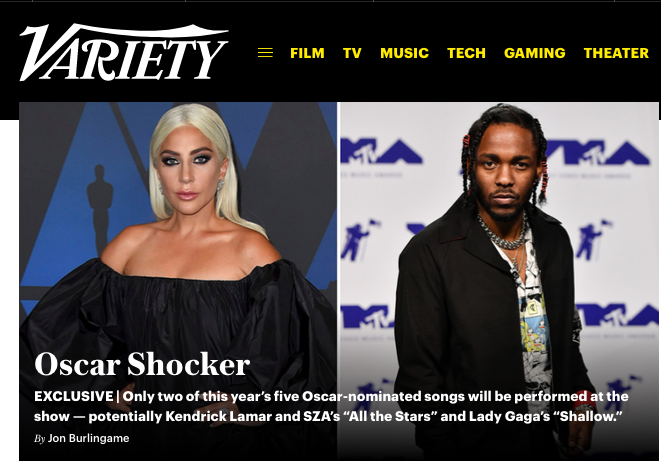 Here is my instant analysis for Variety, written in just an hour or two after the lists were revealed. 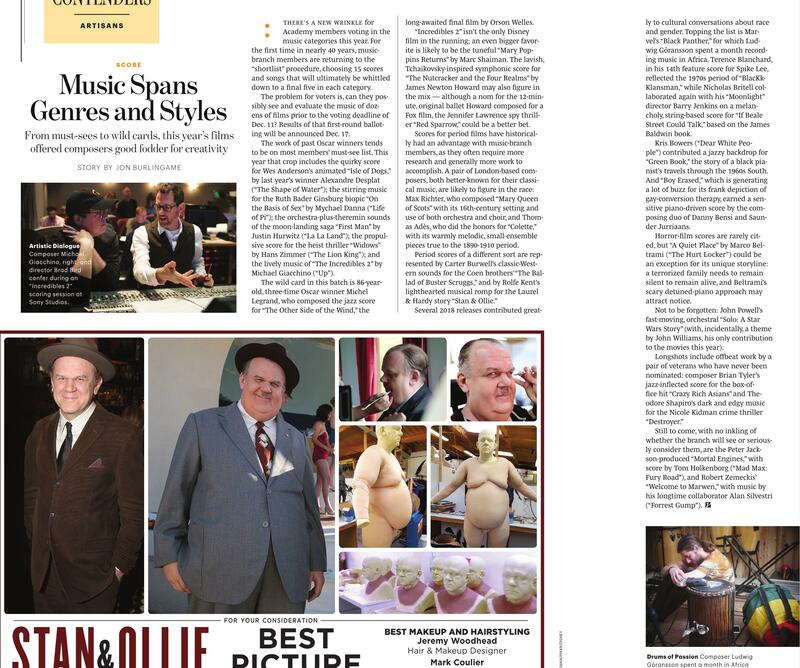 And, interestingly enough, most of the scores were included in my top-10 list written weeks earlier but published that day in Variety‘s Ultimate Awards Guide publication (click on the image to the left). My later, somewhat more detailed, look at the shortlists — and their shortcomings — is here. This entry was posted in Composers, Film Music and tagged Oscar music 2018, Oscar shortlist, Oscar shortlists 2018, Ultimate Awards Guide, Variety on December 17, 2018 by Jon Burlingame. 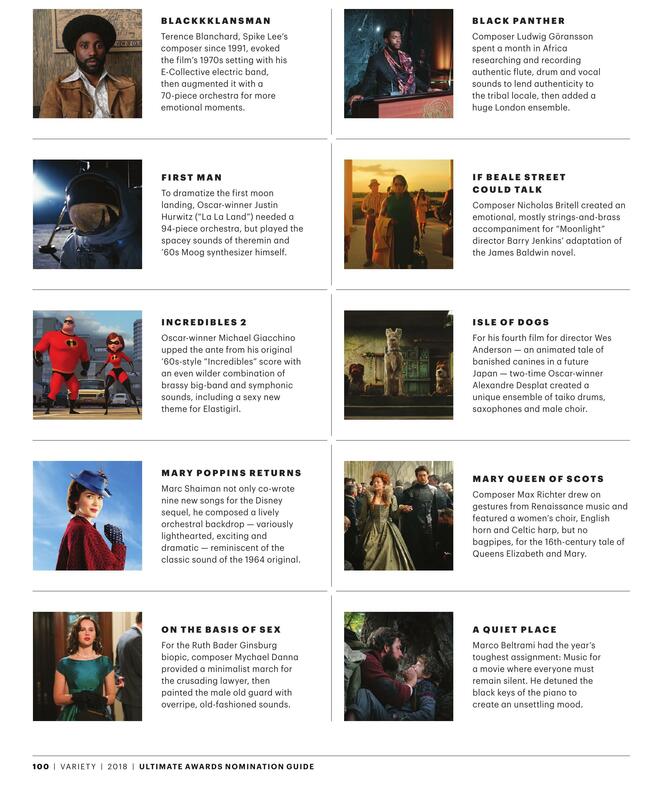 This week, Variety published its first “Contenders” section designed to inform award voters (and watchers) about worthy work in 2018 releases. It may be a record for the earliest one yet (it’s still only October! ); there’ll be another at the end of November. We started with three really interesting stories: Michel Legrand scoring Orson Welles’ final film, The Other Side of the Wind; British classical composer Thomas Ades doing his first film, Colette; and perennial favorite Alexandre Desplat, who has three scores in contention (most likely to gain attention: Isle of Dogs). 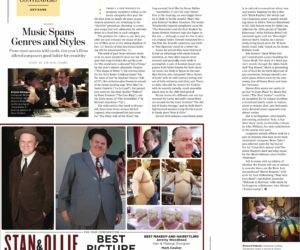 Also in this issue: a preview of my composer panel at the inaugural Variety Music for Screens Summit, which was Tuesday, Oct. 30 in Hollywood. 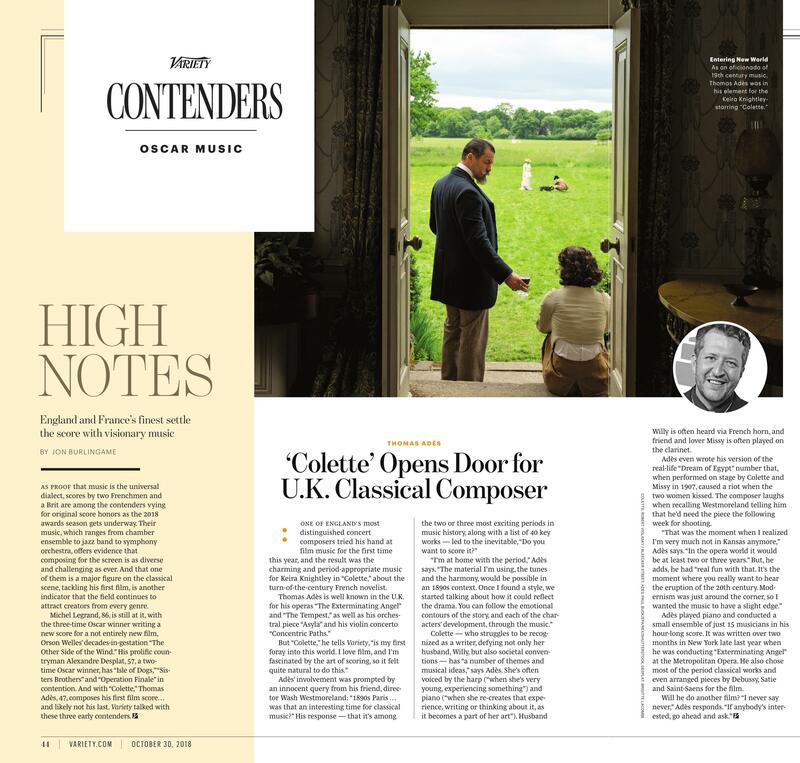 This entry was posted in Composers, Film Music, Interviews and tagged Alexandre Desplat, Colette, Isle of Dogs, Michel Legrand, Music for Screens, Oscar music 2018, The Other Side of the Wind, Thomas Ades, Variety on October 30, 2018 by Jon Burlingame. 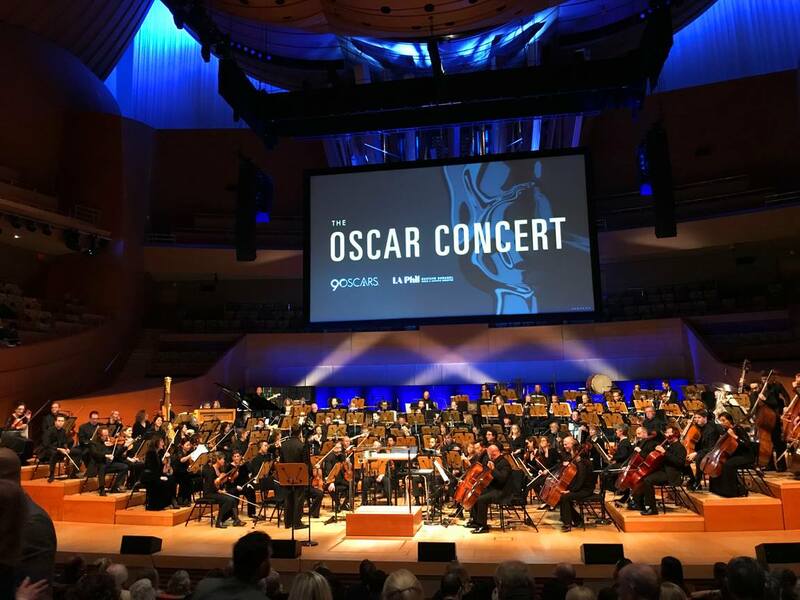 On Wednesday night, the Los Angeles Philharmonic and the Motion Picture Academy joined forces to present an evening-long celebration of film music, highlighting this year’s five Oscar-nominated film scores. But that was only the second half of the concert (featuring conductors John Williams, Alexandre Desplat, Carter Burwell and Thomas Wilkins). The first half took a fascinating look at various literary ideas (love, fear, courage, the chase, etc.) and how composers have musicalized those ideas over the years. Here is an overview of the concert; I was privileged to write the program notes for the evening. This entry was posted in Composers, Film Music and tagged Film Music Society, Los Angeles Philharmonic, Oscar concert, Oscar music 2018, Thomas Wilkins on March 1, 2018 by Jon Burlingame.